Eggs Benedict is delicious on its own, but I found a recipe that all my Maryland friends will love: Eggs Benedict with crab meat. I was scrolling through Pinterest and stumbled upon this breakfast recipe by Megan from Country Cleaver. I am making this a top priority to fix for breakfast this weekend because it sounds (and looks) delicious! Lay toasted english muffins onto plates. Top evenly with spinach. Top spinach with heated crab meat. To make hollandaise: Whisk egg yolks until they are a lightened butter yellow color – about 1 minute. Gently pour in melted butter and continue whisking rapidly to create an emulsion. Whisk in lemon juice and dash of pepper. In a large sauté pan, filled about 2″ deep with water, bring to a rolling simmer. Add in white vinegar. Crack eggs into separate small ramekins. Gently slip 1 egg at a time into water by dipping ramekin into water and tilting until the egg slides out and into the water. Using a spoon gently coax egg whites around the yolk. Let simmer for 2 minutes for each egg, or until egg whites are set. Scoop out of water with slotted spoon and let excess water drain away. Place one egg onto each half of english muffin topped with spinach and crab. 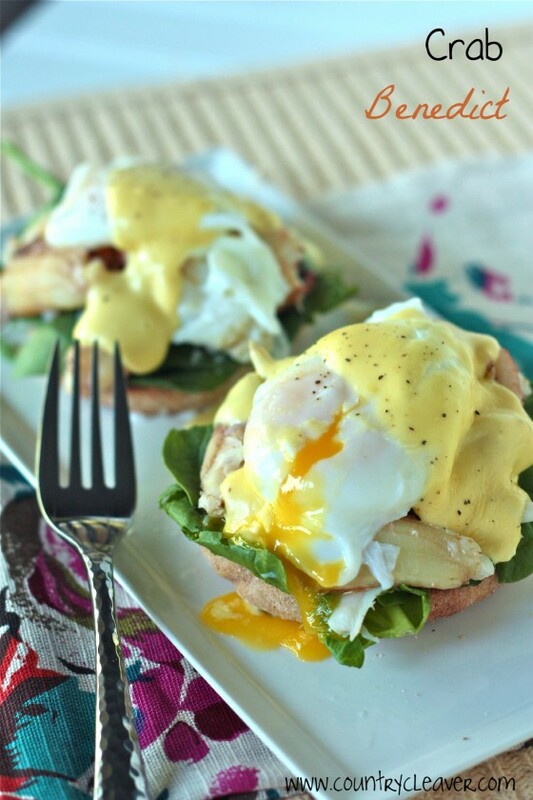 Drizzle hollandaise sauce over the top. Sprinkle on extra pepper if desired, or parmesan cheese. Devour.